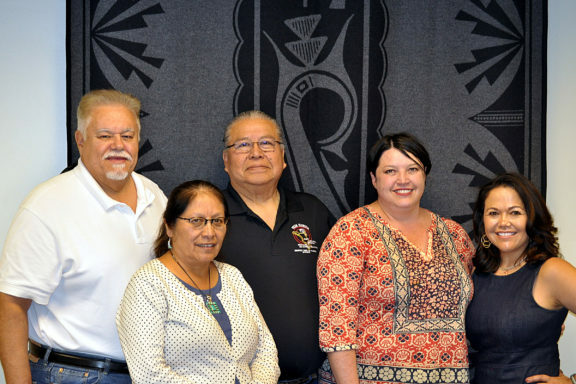 The AIGC newly installed board consists of Rose Graham (Diné) as Board president, Joel Frank Sr. (Seminole), center, as vice president and Steve Stallings (Rincon Band of Luiseno Indians) as secretary-treasurer, Stacy Leeds (Cherokee), Danna Jackson (Confederated Salish and Kootenai Tribes), Walter Lamar (Blackfeet, Wichita), Dana Arviso (Diné), and Holly Cook Macarro (Red Lake Band of Ojibwe). Education has always been important to Joel Frank Sr. and his work on the American Indian Graduate Center Board of Directors gives him an outlet to ensure Native American youth have access to an undergraduate and graduate college education. In August, Frank was named vice president of the board and will continue the work he has done as a board member since 2013. Headquartered in Albuquerque, New Mexico, AIGC’s mission is to provide educational assistance to American Indian and Alaska Native graduate and undergraduate students throughout the U.S. Founded in 1969, the organization has awarded more than 16,000 scholarships totaling over $52 million to students in all fields of study. Frank, who graduated from Miami Dade Community College and St. Thomas University, has had a long and distinguished career promoting tribal self-determination, economic prosperity and community development throughout Indian Country. His leadership positions include having served as president of the National Indian Gaming Association, president of the United South and Eastern Tribes, Inc., board member of the National Center for American Indian Enterprise Development, and member of the Florida Civil Rights Commission.